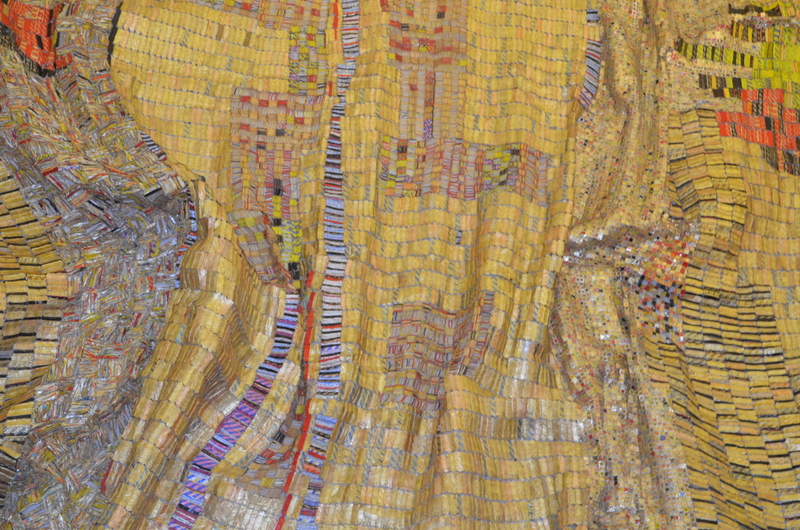 If I thought I had any understanding of African art, this sculpture by Ghanian artist, El Anatsui, caused me to reexamine by perceptions. Shimmering like silk, the 350 pound work of art is currently being installed on a wall in the Bloch Lobby at the Nelson-Atkins. It is entitled Dusasa I. Described by the museum as a tapestry-like sculpture, it is 39 ft by 26 ft and weighs 350 pounds. Constructed from recycled aluminum bottle tops and the strips that encircle the bottle necks, the artist and his assistants flattened the thin metal before beginning their artistic work, fastening the metal strips to create this complex quilt-like pattern. The Dusasa I donated to the Nelson by the William T. Kemper Foundation. It is one of many works the Foundation has donated to the museum. The donation reflects the impeccable standards of both the William T. Kemper Foundation and the Nelson. For Kansas City residents it is another reason to visit a home-town treasure. For anyone living outside the Mid-West, it is one more reason to visit the heartland. This entry was posted in Photography and tagged African Art, Art, Contemporary Art, Liquor Bottles, Modern Art, Nelson-Atkins, Nelson-Atkins Museum of Art, Tapestry. Bookmark the permalink. Obviously time for anothr visit. The Nelson just gets better and better. It is always worth a visit.